For those of you who know me – you know I LOVE bacon. I’ve been in this relationship since I was a child. It wasn’t one I had to constantly work on. No, no, no… It seems to always just be there. 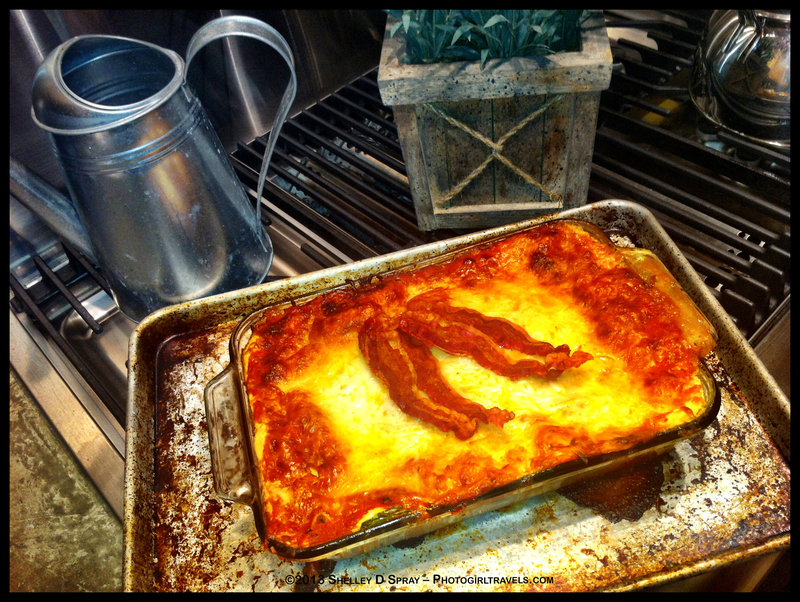 In my drawer, at the store, on a plate on my desk….So it just made sense one day, bacon would be the perfect 5th food group – in lasagna! 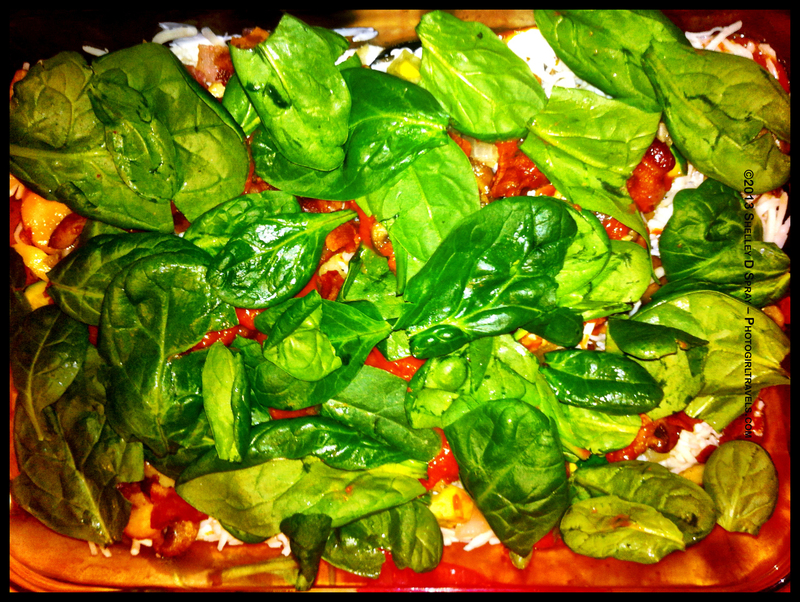 And hence it was born… My special Vegetarian Bacon Lasagna. I hope I’m not posting this too late for those of you trying to decide what to cook for Super Bowl Sunday. As I sit at my desk it’s early morning on that exact day. I’m sure men and women had sleepless nights, tossing and turning, and dreaming the color of the team they are hoping to win. But as you check your email, Facebook, Linked In pages – wrapped under your covers, I hope this will give you the perfect recipe. Imagine sitting in front of the TV with a huge plate of steaming Bacon Lasagna, ice cold beer in your hand, watching your favorite team play. This recipe is packed with fresh vegetables, multiple cheeses and a few surprises, capers being one. 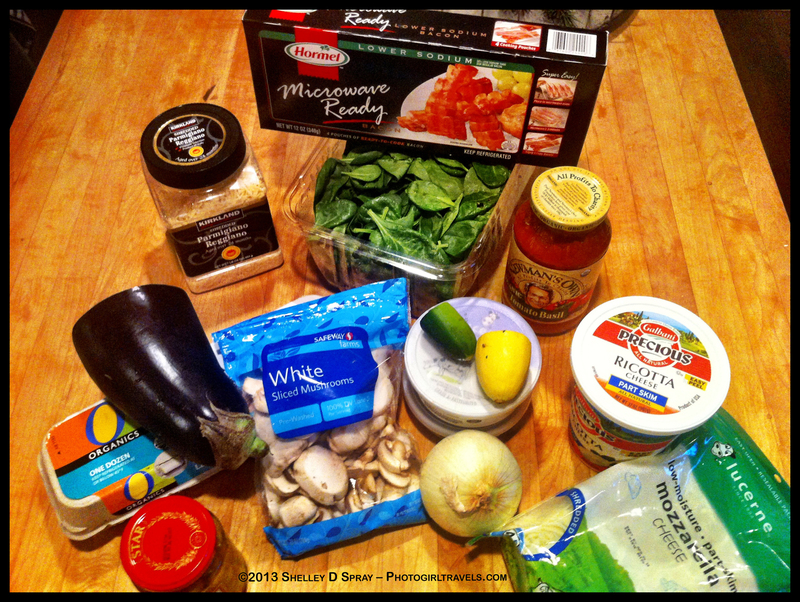 Vegetables: Whatever you like but here are some ideas: These are ones you’ll want to sauté first: Eggplant, mushrooms, zucchini, onion, garlic. I also love spinach but don’t cook it first. You’re just going to layer it raw. Once everything is ready, you just layer. I put the pasta sauce on first, then the noodles, then the ricotta cheese, veggies, bacon, other cheeses, a few capers, spinach, a dollop of sour cream. The last layer should have pasta sauce and cheese on top. Bake at 375 degrees for around 30-45 minutes. It’s hard to say because it depends on how large your baking dish is. It should be bubbling. I also take the foil off when it’s ready and let it cook just a bit longer to brown the top. Serve with a fabulous red wine or super cold beer!!! And of course, GO NINERS!!! Categories: Travel into My Kitchen! | Tags: Bacon, bacon lasagna, Baltimore Ravens, blog, cheesecake, Colin Kaepernick, cook, cooking, double layer cheesecake, Jim Harbaugh, Joe Flacco, John Harbaugh, kitchen, Lasagna, new orleans, NFL Championship, Patrick Willis, photography, pioneer woman, Ray Lewis, recipe, road to the super bowl, San Francisco 49ers, super bowl, super bowl 2013, Super Bowl Sunday, Super Bowl XLVII, travel, ttot | Permalink.